The Alabama Slammer comes in two forms: this shooter and a refreshing highball. They contain the same ingredients, but with slightly different proportions to account for the volume. It is a fun and fruity shot drink that was once far more popular than it is today, though it is still worthy of note. Drinks like the Alabama Slammer may not be as popular as they once were, but they are a good throwback drink. Serve it at retro-themed parties or when celebrating a University of Alabama Crimson Tide victory. This shot will shake up to be about 2 1/4 ounces. That might not fit into your shot glass unless it's a very tall one. The solution is to strain it into a rocks glass or create two shorter shots and share it with a friend. 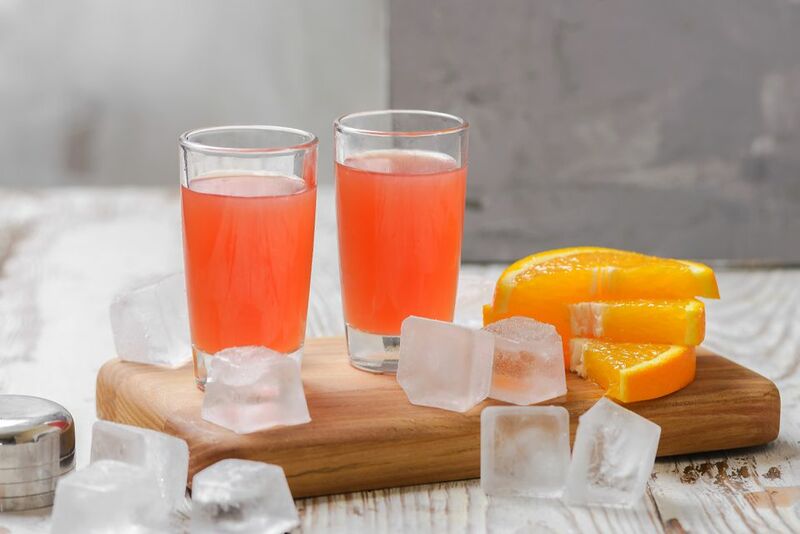 As it often goes with drinks that have long-standing popularity, there are a number of ways to make the Alabama Slammer. Try one of these shooters instead, they're all made the same way: shake it, strain it, and shoot it. With Grenadine: Mix 1 ounce each amaretto and Southern Comfort with 1/2 ounce each lime juice and grenadine. With Lemon: Mix 1/2 ounce sloe gin with 1 ounce each amaretto and Southern Comfort and add a dash of lemon juice. With Jack Daniel's: Mix 1/2 ounce each amaretto, Jack Daniel's Tennessee Whiskey, orange juice, and creme de noyaux. Why So Many Alabama Slammers? The story of the Alabama Slammer says that it was created in the 1970s near the University of Alabama. The school colors include crimson, which is the color of this shot. During that time in bar history, it seems that everyone was throwing anything (and everything) into drinks and some of the most bizarre mixes were created. Not only were the drinks of this era super sweet and very fruity, they often included ingredients like the sloe gin and SoCo found in the Alabama Slammer. Not surprisingly, both of those spirits have also lost their mass appeal since that time. As you can tell in the many Alabama Slammer recipes, the point was not always what was in the drink, but the final color. For one reason or another, bartenders (pro and amateurs alike) simply started to switch it up. Maybe one person didn't have sloe gin or another had a bottle of Jack Daniel's. If it was red and included amaretto, it seemed perfectly logical to call it an Alabama Slammer and this is not the only drink this happened to (the rum runner is another example, though there are many). The next time you're in one of those endless bar debates about what goes into this drink or that one, you can always toss out this argument. Maybe you can even come to an agreement that the bar world is filled with mystery, a million "what's in the bar" moments, and a lot of popular drink names. In that way, neither of you is right or wrong and you can go back to enjoying your drinks. How Strong Is an Alabama Slammer? The three liqueurs that make up this Alabama Slammer recipe are relatively mild, so the shot is as well. Generally, its alcohol content will be in the 20 percent ABV (40 proof) range, so it's not the strongest shot you can mix up.